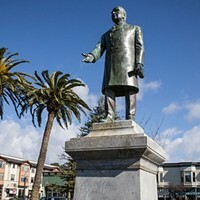 The plaque on the Arcata Plaza referencing "Indian troubles." I grew up at the base of Fort Humboldt, in the cul-de-sac right across the street. As a child, I played over every inch of that land, including the boggy area at the bottom of the bluff. We would lay boards down into the blackberry thickets, moving forward until we were in the center of the swamp, and then we would reach into the branches of the trees, pulling ourselves up as the boards half-sank in the brackish water. One of my earliest memories is struggling to climb out of that marsh: My boots are filled with water and my friend is hauling me up. One of my boots gets left behind and sinks, and I struggle up onto the bank. My friend and I lie there on our backs, breathless, and look up at the blue sky. With memories like these, perhaps I can be forgiven for feeling as if I belong to this land, as if I had crawled up out of the mud and began my life right there at Fort Humboldt. When you grow up in a place, it can feel like it belongs to you — almost as if its history started with you. But, of course, Fort Humboldt has a history that predates mine. And it is a brutal history, indeed. Established in 1853, partly in response to demands that the government protect the settlers from "Indian depredations," the leadership quickly discovered that Native people had far more to fear from the white settlers. As the number of settlers increased, they helped themselves to the land without respect for the rights of the people who had lived there for thousands of years. Settlers hunted and shot indigenous people, raped women and sold children into indentured servitude. Eventually, after a series of massacres, a "corral" was built by the soldiers to house the last indigenous people. Many died in that corral and those who survived were eventually forcibly moved to the peninsula and then to the Smith River Reservation. As a child, I did not learn this side of Fort Humboldt's history. The plaques that adorned the historical buildings were steeped in enthusiasm for the pioneer spirit and the westward march of "progress." I recently returned to Fort Humboldt and found that much had changed from my childhood. At least there is now a walk outlined with signs that told a truer version of events. It is not all that needs to be done to correct the revisionist history but it is a start. This is the insidious nature of institutionalized racism: It hides in plain sight. I grew up playing in a place that celebrated genocide — a place whose congratulatory version of history had been written solely by those in power. It can be an uncomfortable experience when you realize that a place that has nurtured you, is the same place that has subjugated others. 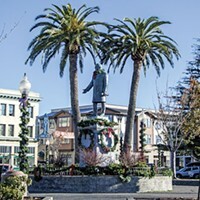 The Arcata Plaza is a perfect example: Over the years, I brought my children to that plaza to enjoy the green grass — never even noticing a plaque in the southwest corner that portrayed settlers as the victims and Native people as the aggressors. And although the statue of McKinley loomed on a pedestal overlooking all, I never bothered to look into the history of his presidency. The Wiyot tribe asked us to awaken to that history when they issued a press release in support of removing the statue and the plaque. Upon researching McKinley, it became obvious to me that his presidency was certainly infused with the spirit of the times — one in which the rights of indigenous people were relentlessly trampled upon. 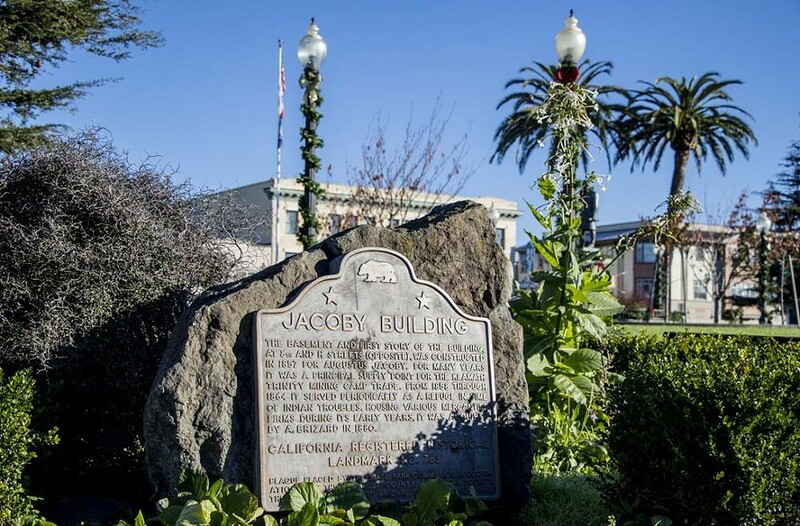 Given the history of this area, it should come as no surprise that the past citizens of this town would place a memorial to a president like McKinley in the center of their town. But now that the city council has voted to remove the statue and the plaque, the question is: How much will the current citizens rise up to defend what McKinley stands for today? 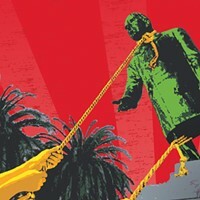 It was disappointing to me to see that a Facebook page has already sprung up claiming that the movement to remove the statue is "an attack on the honest history of our community." Personally, I would save the word "attack" to describe events such as the massacres that happened 158 years ago, when three different Wiyot villages were actually attacked by white men who were wielding guns, knives and hatchets. They attacked unarmed women and children in their homes and brutally murdered them. The law never brought the perpetrators of these horrendous massacres to justice. Instead of throwing the word "attack" out in regard to our local history, I would suggest the word "amend." Perhaps even adding the idea of making amends. 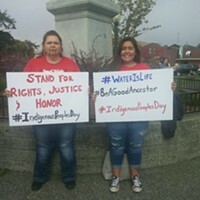 That is exactly what we have the opportunity to do in respect to our Native community members — not only in the case of the Arcata Plaza but in the returning of land on Indian Island to the Wiyot tribe. Making amends is exactly what our community did when cranes lifted the Trinidad lighthouse off the funerary remains of Yurok people. None of these things come easy, nor do they come cheap: Making amends rarely does. As someone born and raised in Humboldt County, I understand how these local places become infused with our own personal histories. We make our memories as we live our lives. We feel protective. Often the symbols served as a backdrop to the lives of our parents, ourselves and our children. But if we want to live in an inclusive community that values all people, we need to let some of these symbols go. Despite our fondness, we need to loosen our grip on these historic places. After all, their history did not begin with us.